Developing story is a heavy indictment of LA County officials. ... and other crimes to be described later. "I, (name), do solemnly swear (or affirm) that I will support and defend the Constitution of the United States and the Constitution of the State of California against all enemies, foreign and domestic; that I will bear true faith and allegiance to the Constitution of the United States and the Constitution of the State of California; that I take this obligation freely, without any mental reservation or purpose of evasion; and that I will well and faithfully discharge the duties upon which I am about to enter." ...every officer and employee of the State, including the University of California, every county, city, city and county, district, and authority, including any department, division, bureau, board, commission, agency, or instrumentality of any of the foregoing. Why is this important? Because in the case of Rawesome Foods, key figures who signed search warrants, conducted the armed raw milk raids, and prosecuted James Stewart did not have oaths of office on file. Thus, they acted outside any official capacity and engaged in their actions against James Stewart with only the standing of private citizens, not public servants / officials. Michelle LeCavalier deemed an "impersonator"
That document, which was cited to justify the use of armed force against a man distributing raw milk to happy customers, stated that Michelle LeCavalier believed "a felony has been committed or that a particular person has committed a felony." It goes on to "COMMAND TO SEARCH" "ANY SHERIFF, POLICE OFFICER OR PEACE OFFICER IN THE COUNTY OF LOS ANGELES" the Rawesome Foods property. Critically, at the time Michelle LeCavalier signed this search warrant -- August 1st, 2011 -- she had no signed Oath of Office on file for her position as required under the California Constitution as well as health department procedures. In your letter you expressed concern over the absence of a public record regarding the Oath of Office for Environmental Health Specialist Michelle LeCavalier. Your letter also suggests Ms. LeCavalier should not have received compensation unless an oath is taken per the California Government Code section 1367. Department of Public Health procedures require the appointment of Deputy Health Officer and oath of office to be given at the time of badge issuance. However, a review of Department policies and practices indicate a need for improvement in the recording process and corrective measures have been initiated. 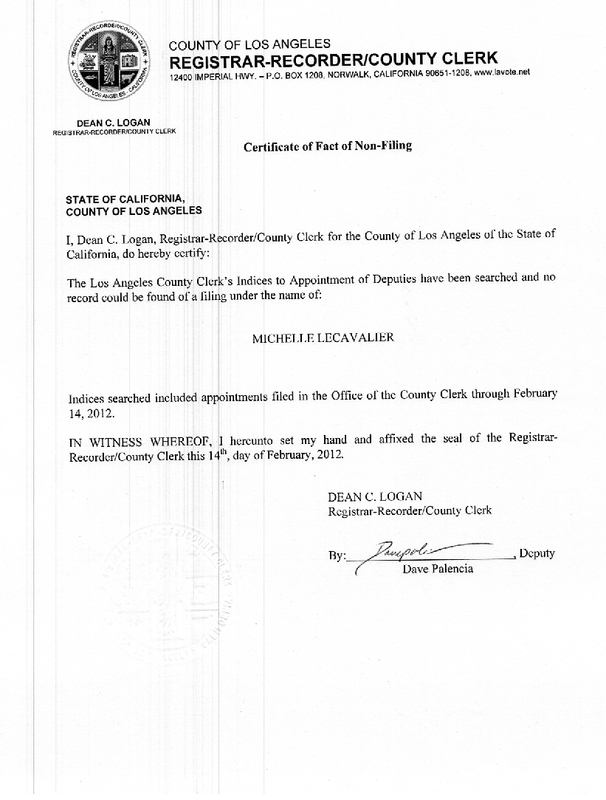 It reads, "The Los Angeles County Clerk's Indices to Appointment of Deputies have been searched and no record could be found of a filing under the name of MICHELLE LECAVALIER. Indices searched include appointments filed in the Office of the County Clerk through February 14, 2012." 3. 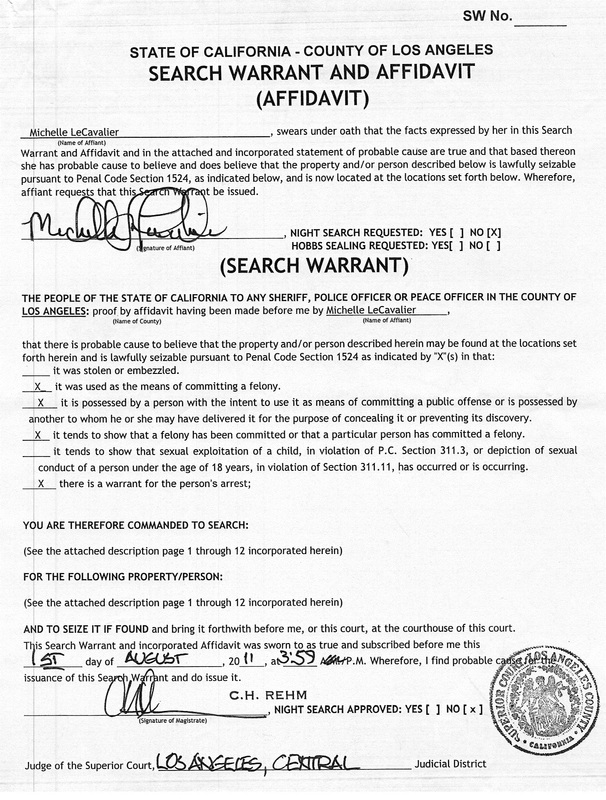 The parties who signed the Warrant and the Complaint for said warrant, Richard Ballou as declarant and complainant, and Michelle LaCavalier as witness and affiant of the search warrant, were both acting in their official capacities, but neither have a valid oath of office filed on the record as required pursuant to the State of California Constitution Bill/Declaration of Rights Article 20 section 3, and pursuant to law, have been and were, specific to this matter, impersonating public officials, which is a felony (see exhibit 'B'). Wherefore, because all actions by the state agents/actors have been performed in a criminal manner, fruit of the poison tree, and in violation of Stewart’s guaranteed and protected rights and resulting charges specific to this matter have been done in violation of clearly established law and because jurisdiction cannot be proven on the record, this court should sua sponte dismiss the charges. Therefore James Stewart, defendant in error moves this honorable court to dismiss all charges with prejudice. 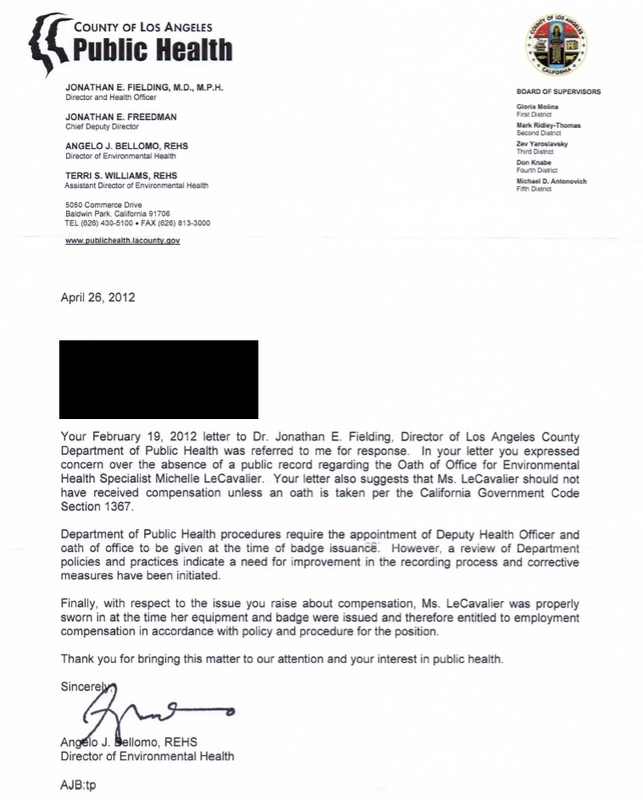 As a result of this remarkable oversight on the part of the LA District Attorney's office and the Los Angeles Health Department, the search warrant raid document bearing Michelle LeCavalier's signature which was used to justify the armed LAPD raid on Rawesome Foods was null and void. It carried no official legal standing whatsoever. NaturalNews recently learned that Michelle LeCavalier has, in the last few months, taken steps to get an Oath of Office sworn, notarized and on file. This alone is evidence that her Oath of Office did not exist in 2011 when the Rawesome search warrant was signed... and it certainly did not exist in the years prior to that. This means that the entire armed raid on Rawesome Foods was illegal, as it was conducted without a valid search warrant signed by a state official bound by a signed Oath of Office as required under California law. This, in turn, means that any and all evidence acquired as a result of this search is invalid and inadmissible in a court of law. Even more, it means that the LAPD officers who conducted the armed raid weren't fulfilling a search warrant at all, but were actually (and inadvertently) engaged in what could reasonably be defined as the armed robbery of a private business which resulted in the destruction of over $50,000 worth of property and the kidnapping of a private individual. It even turns out that at least one of the LAPD "officers" who participated in the raid also had no oath of office on file, either. This is an explosive development because it means "law enforcement officers" from LAPD were actually just private citizens impersonating peace officers and wearing costumes featuring badges and guns. It furthermore means that their actions are not protected under state immunity laws and that James Stewart can individually sue each and every member of the LAPD, LA Health Dept. and LA District Attorney's office who conspired to raid his business at gunpoint, destroy his private property, forcefully kidnap him and deny him his civil rights. But that's not even the worst part of all this. There's also, of course, a cover-up. This kind of secrecy is, of course, the essence of tyranny. When those who claim to uphold the law will not, themselves, transparently and openly abide by the law, the entire system devolves into a lawless criminal racket that often targets innocent citizens. When the District Attorney's own "officers" operate in violation of the Constitution of the State of California, they obviously cannot be counted on to uphold the law in the first place. This is probably why we see such selective and punitive prosecution against a California "milk man" who only sought to distribute healthy, wholesome unpasteurized milk to a long list of happy club members, none of whom were harmed by James Stewart's actions. This letter, signed by LA District Attorney Steve Cooley, appears to be a blatant cover-up to avoid releasing signed Oaths of Office of DA investigators. The DA's excuse for not releasing oath signatures is fallacious and invalid: that signatures are "personal materials" and therefore "exempt" from public disclosure, he claims. This is absurd on its face, given that the Oaths of Office are, by their very nature, public documents whose sole purpose of being created is to ensure that public officials serve the public interest and defend both the state and federal constitutions. Without a visible signature, such documents are null and void. It is the signature that binds the person to the oath. The DA's assertion that "we are sworn to protect the public, but we cannot disclose our signatures swearing our oath to protect the public" is absurd. It stands as an example of a belief that government rules over the People and that the People have no right to demand accountability. Government by secrecy seems to be the norm in the LA District Attorney's office, which exercises vast powers to arrest and prosecute individuals and thereby deprive them of life and liberty. That a government agency with such widespread powers would not even be willing to disclose documents confirming its compliance with California law is beyond disturbing. It is actually a sign that the runaway criminality of California government has crossed a tipping point and is now descending into accelerated lawlessness. Another obvious sign of the insanity of this organization is that while violent criminals run loose on the streets of Los Angeles, the DA's office spends what surely amounts to millions of dollars in taxpayer money in an attempt to jail a 65-year-old senior citizen "milk man" who is no threat whatsoever to the public. But there's an even bigger story behind all this. What NaturalNews is uncovering here is a systematic, deeply-ingrained culture of willful lawbreaking by the Los Angeles DA's office. The lack of Oaths of Office among DA investigators and prosecutors may now put thousands of criminal convictions at risk of being overturned, due to the fact that many DA employees apparently operated in "official" capacity without having signed Oaths of Office on file as required by law. This startling situation can now potentially invalidate thousand of search warrants that led to arrests of violent criminals, rapists, fraudsters and even child molesters. Any and all evidence acquired under search warrants signed under false pretenses (by people "impersonating" DA "officials") may be thrown out of court, causing a judicial crisis in L.A. County and resulting in the loss of tens of thousands of hours of police work and detective work. 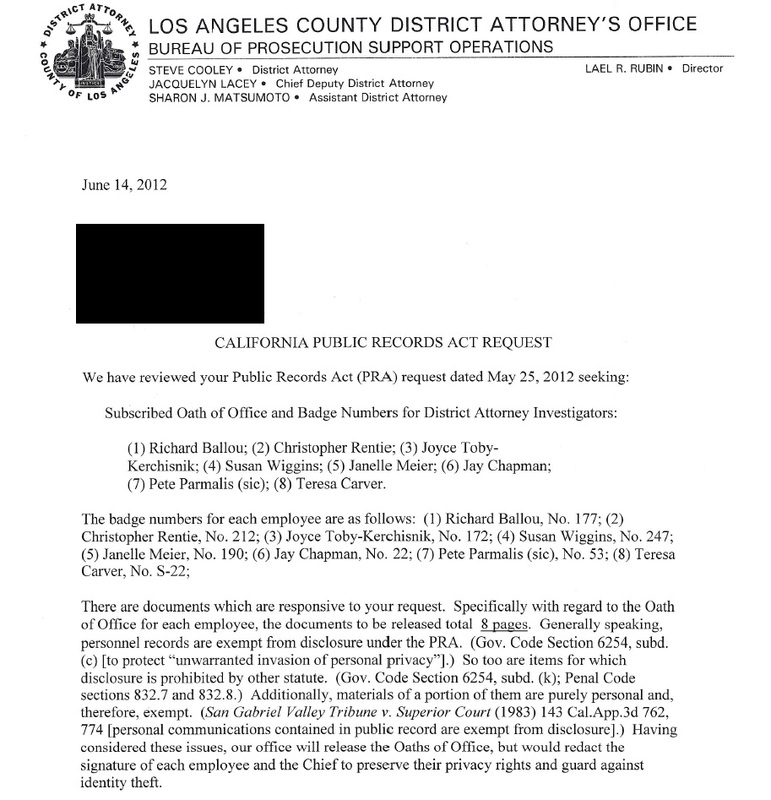 As a long-time supporter of local law enforcement myself -- someone who has been recognized and honored by the Chief of Police of a large U.S. city -- I am horrified by the thought that the Los Angeles District Attorney's office has been operating outside the law for many years, violating the California Constitution and using invalid search warrants to conduct what are now exposed as illegal armed raids on California citizens. No wonder the DA wants to throw James Stewart in prison and hope this all goes away. But it's not going away, of course. Now, the Los Angeles DA's office might even engage in desperately trying to fabricate back-dated Oaths of Office -- an act which is itself a felony crime. They must try to salvage their prosecutions before the truth catches up with them... and before the thousands of defense lawyers who operate in Los Angeles realize they can get their clients off the hook by challenging the Oaths of Office of DA "officials" who falsely signed search warrants that led to arrests which are now null and void. Agree with posting by anon First, if you don't like a law, work to change it, don't break it Second, if you do break the law, then you need to plead your case in court, don't skip bail Third, if you do skip bail, then expect for bounty hunters to come after you Fourthy, if the bounty hunters had to come get you, don't expect kid glove treatment in jail, you demonstrated you could not be trusted, and that is what happens If you can't do the time, then don't do the crime Don't act like you don't care by knowingly choosing to break the law and then further inflame by skipping bail and then crying like a baby. I saw an article saying this guy was kidnapped, and the bounty hunters did something wrong, and impersonated law enforcement, and roughed him up, etc. etc. etc. However the video they showed as proof showed the exact opposite. Get over it. This chain of events is unfortunate, and I believe there are two sides to every story. All this exaggerated, and to some extent, crafted nonsense to make it look worse comes from the assistance of three people that are not all who they appear to be. See the site www.eftscam.com. They are good at spinning tales and getting others to spin tales so waters become quite muddied. Poor James has gotten himself hooked up with these...ahem...tale spinners and he has gotten some poor advice. I agree about saving our food supply and the hazards of fluoride. This isn't anything new nor is it cause for targeting James to exclusion. It goes beyond that. It has to do with some of this sovereign citizen nonsense and poor advice from his sovereign alibabas. James needed to appear in court or people that put up the $100,000 bail would be out that money. So the bounty hunters came and escorted him albeit not gently but not with undue force. The use of chosen adjectives to skew the picture makes for great drama. However, the adjectives aren't correct for the context. I hope he starts listening to his attorney and not the alibabas who don't even speak the truth about themselves. His choice. This kind of abuse goes on daily because the American people have become so docile and afraid of "authority" that we are sitting ducks for these sociopaths that seem to be inclined to seek public office. Other than those who are trained by the military or police forces to be otherwise, we are TOO NICE, TOO OBEDIENT and TOO AFRAID. We will continue to be scorned, ignored and robbed as long as we confuse apathy with "decency". Like the bumper stickers say..Freedom Isnt Free..it takes maintenance or we end up like this..taken over from within. Steve Cooley has also been using DA investigators to carry out his personal agenda to harass people. Full Disclosure reported on it. Cooley's good friend Roger Grace has a news paper called the Met News and is a hench men for going after Cooley's foes. Cooley doesn't like someone, Grace's news paper targets them. RICO scandel to the max. Cooley is a pathetic corrupt psycho path with entrinched corruption and should be investigated by the DOJ for the corruption going on in that office. The Attorney General won't go after him because she needs to get re-elected. The DOJ needs to step in. I have been reading naturalnews.com for many years, the owner, Mike Adams, is on the Alex Jones show (infowars.com), and I have come to totally trust both of them with extremely accurate and up to date news on the planet. I strongly urge those who want to know what is going on to add "naturalnews" and "infowars" to your reading list. After reading slaem-news of course. On another note, about6 years ago I started advocating the removal of flouride from our water, its a poison and hurts children mostly..I was called "tin foil hat", or "the ADA and other dentists say its safe", well the ADA and the dentists that agree it safe are of a group that have other agendas in mind rather than health. Their pocketbook. The government already had to back down, and lowered the sodium flouride in our water 40%. Now, Harvard University says its bad...I think I will keep my tin foil hat on, I seem to have this 98% accuracy rating over the many years. http://www.marketwatch.com/story/harvard-study-finds-fluoride-lowers-iq-published-in-federal-govt-journal-2012-07-24 Thank you for posting this article, naturalnews is a great website.